A mother blackbird, obviously desperate for a place to build a nest, has stowed hers away in the planter on my kitchen balcony. La pauvre! I discovered it after she had already laid the pretty pale blue-green eggs; then I remembered the persistent blackbird that I had had to keep chasing away from one planter after another a few weeks earlier. It shows how much I've been away recently. A couple of years ago we had a pigeon's nest on the front balcony planter. The single baby was big and hideous, and it died when its parents never came back to feed it. 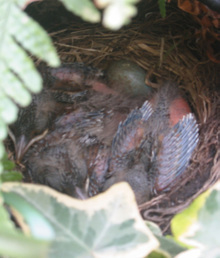 Last week I watched the blackbird babies hatching-- all but one egg which must be addled-- and the next day you could see their little mouths, opening wide to almost the full width of their heads, straight up in the air as if to the sun god. It means I can't open the kitchen window on hot days, for fear of frightening the mother away. I hope it stays cool in Paris for a while now. They're already a lot cuter. 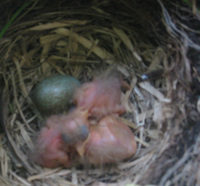 The first photo shows them the day they hatched, and the second one this morning. It's hard to see, but there are three of them. One of my cousins told me this story at Easter. The family is very Catholic, and on Good Friday she took her two boys to confession. The younger one is five or six. "Can I go in, too?" he asked his mother. "Michael can go in!" "You're not old enough, darling," she said. While Michael was in the confessional, his little brother sneaked up and peered through the slats. "Guess what!" he said when Michael came out. "I went and looked inside! I know what's in there!" "Oh yeah?" Michael said. "Did you see the hidden staircase?" The confessional story reminds me of the famous story "The First Confession," by Frank O'Connor, which my Irish father read aloud to me when I was a child. He would laugh so hard as he read it that tears ran down his face. Seen in a "palace hotel" lobby. A tall, tan, pretty, slightly hard-looking blond American woman, about 35, and her very bratty toddler (I'm a mother, believe me I have a lot of sympathy, but this was a case of just pleading ineffectually with a whining child-- and the child was winning. A grownup should not be pleading with a child of two). And a gray-haired, wrinkled, well-dressed man of at least 75, trying to read the newspaper in peace. The child's exhausted, unhappy-looking "Daddy." It reminded me of that famous old saying, "Marry for money and you work for a living." This is the first time I felt sorry for the male half of that equation.